In this workshop students will learn explore the art of hand-typesetting with lead type and printing on an old-fashioned letterpress. Students will learn the layout of the California Job Case and the instructor will present a small bit on the history of hand-typesetting. Students will bring their own writing or other piece of text to set, and will learn how to set type, proof it, and print it using the letterpress. 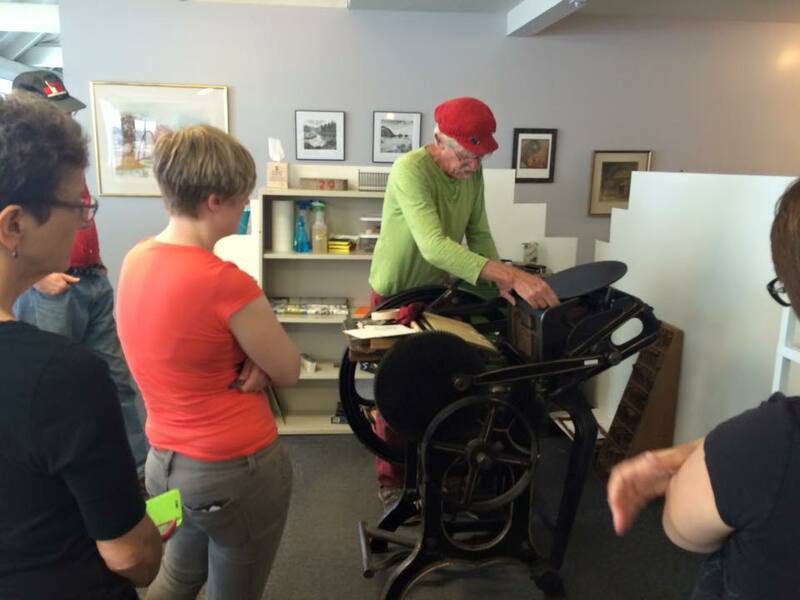 If they are taking either of the other letterpress workshops, we will cover how to register linocut or polymer images with the handset block of type and we will also cover how to incorporate hand-typesetting into other printmaking. All materials are provided, including paper, inks. Participants should have some text in mind, several lines long: a poem, a song verse, etc. Register and pay in full to reserve your spot. To cancel a workshop enrollment, please email studio@whitprint.com. You'll get a full refund if your request is received at least 10 days before the start of the workshop, or a 50% refund if it is received at least 3 days before the start. When Kristin Walker discovered letterpress printing in the spring of 2003, she found herself immediately drawn to the rhythmic sounds of hundred-year-old antique machinery, the smell of printer’s inks and oil mingling together, and the deliciously tactile impression of metal type and images on cotton paper. Kristin pursued many different avenues in art and design during college, and ultimately earned double-BFA degrees in Multimedia Design (with a focus in graphic design and printmaking) and Photography from the University of Oregon in 2007. After college, she attempted to find work in a professional photo studio, but settled for a job in corporate marketing and design. A chance connection and quick friendship with a retired, third-generation letterpress printer, Bob Giles, reignited Kristin’s passion for antique machinery and old-fashioned printing...she quit her marketing job in order to found Twin Ravens Press (www.twinravenspress.com) in the fall of 2007. When she’s not teaching paper arts or doing commercial or artistic work for Twin Ravens Press, Kristin also enjoys teaching and participating in various forms of social partner dancing (including blues, jazz, lindy hop, and tango), traveling, eating spicy food, and cuddling cats.